Movement has been something we aim to capture at every shoot, whether it be the way the wind swept your hair, how it caught your veil or simply how your gown danced across the dance floor. So much emotion can be caught in an image if you set out to capture it in a certain way. When we made plans to head to the desert for WPPI, we knew we couldn’t let the week go buy without capturing some beautiful images with that warm desert glow. 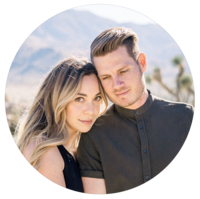 When we heard Janna Brown designs would be putting something together along with other creatives, we knew we couldn’t miss the opportunity to capture the magic on that dried up lake bed. With the flow of a golden green Carol Hannah Gown and all the essentials for a gorgeous ceremony site and reception, we captured what we hope would be a very good inspiration to head to the desert to elope!